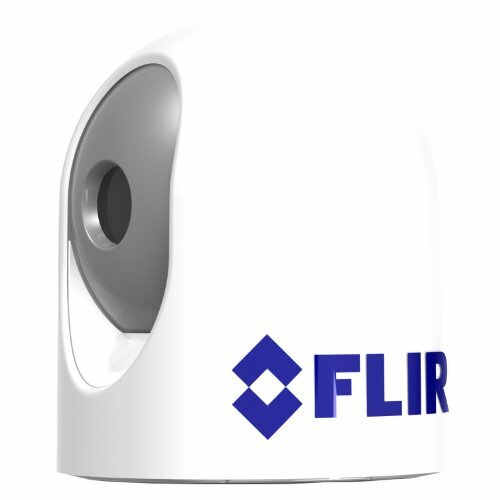 Monitor Your Home or Business with This Rugged, Full-Featured IP Camera This easy to mount, fully featured dome Internet camera from FLIR has everything you need to monitor your residential or commercial property. Compatible with popular third party VMS software, you can run this networked camera from any device that has a connection to the Internet. Use the mobile apps for iOS and Android to check in from any location. With 1080p picture quality at real-time and a 2.8-12mm Varifocal MegaPixel lens, you'll enjoy clear image quality. This camera is also equipped with IR illuminators so you'll get images that are as good at night as they are during daylight. This camera is IP66-rated weatherproof and vandal proof, making it ideal to install in any high-risk outdoor space. The three-axis mounting system ensures that the camera can capture images from any area of the premises, and its PoE capability opens up a world of installation options. To back up the images recorded by the camera, the system is compatible with microSD, FTP, NAS and local networking. Monitor whatever you value with the Varifocal IR Vandal-Proof Dome IP Camera from FLIR. Now even small-boats can see clearly at night with the new MD-Series Fixed Mount Thermal Night Vision Camera from FLIR. The MD-Series delivers stunning detail and clarity day or night thanks to its state-of-the-art FLIR thermal imaging technology. The camera can easily detect floating objects, navigation aids, other vessels and even people in the water with ease. Engineered for smaller cruising, fishing and sailing vessels, MD-Series is both compact and lightweight. The camera measures 5.9-inches in diameter and just 7-inches high. The small footprint allows the camera to easily mount on any T-top, cabin roof, radar arch or mast. The MD-Series is available in 2 versions to suit the needs of different types of boaters. The MD-324 features a 320 x 240 pixel thermal imager with a wide angle 19mm lens. The MD-324 features a 2X digital zoom allowing you to magnify distant targets for enhanced viewing and identification. Fast-moving craft will appreciate the enhanced long-range performance of the MD-625 camera with a high-resolution 640 x 480 thermal imager and 25mm lens. The MD-625 has a 2X and 4X digital zoom for enlarging distant targets. Both the MD-324 and MD-625 have 30 Hz refresh for smooth, clear images. Get Total Coverage with This Full-Featured Surveillance Cam If you're looking for a full-featured, professional IP camera, then look no further. The observation power on this network camera from FLIR is remarkable. You can enjoy close-up surveillance across a significant distance; the optical zoom feature moves the view up to 30 times closer. With its built-in IRs and automatic day/night switching, you're guaranteed quality imaging in any lighting conditions. Night vision works up to 500 feet; perfect for monitoring a warehouse or parking lot. And, with remote access, you can view recorded footage or live broadcasts from anywhere; you can connect from any place with a high-speed Internet connection directly from your smartphone, tablet or PC. Position this Internet camera in locations that provide the widest range needed for any surveillance tasks. The built-in software and hardware will do the rest. The camera's tilt, pan and scan features will customize the view across many city blocks to focus on objects, areas or people in crystal clear 1080p HD. Equipped with excellent optics, this IP cam will detect human movement and set it apart from background features. Features include input and output connections that will accommodate audio, alarms and light or motion sensors. And, its tough, weatherproof design will provide excellent service inside and out. For full, professional property monitoring, the FLIR DNZ30TL2R PTZ IR Speed Dome IP Camera has you covered.